Following on the two previous talks, we got one more event in the Gi2MO calendar for this year: a presentation on semantic search during the 7th International Conference for Internet Technology and Secured Transactions (ICITST-2012). In more technical terms, this work involved a number of experiments with synchronising distributed IdeaStream instances using our RDFme solution and Gi2MO ontology to provide data integration. The experiments were based on integration of ARC2 triple store into Drupal and constructing some user interfaces on top of it (for example with Exhibit from SIMILE project for faceted browsing capabilities). Lastly, we also did some experiments on scraping ideas from regular web content using a tool called Scrappy. 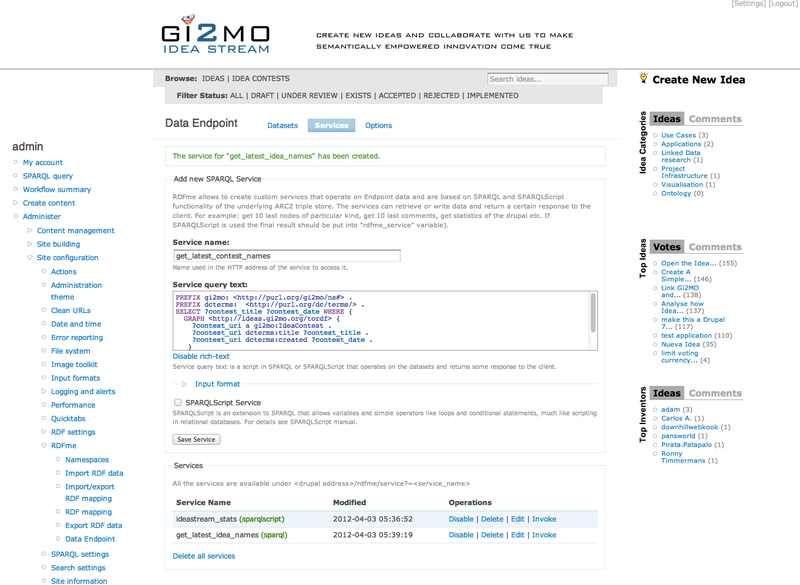 The obtained data was structured according to Gi2MO Ontology and treated like a data source of any other Idea Management System (therefore enabling search together with normally submitted ideas via IdeaStream). As a follow up of that research some time ago we actually released new RDFme version that allows sync between Idea Management Systems and distributed querying. If you follow the blog this was demoed with an iPhone app client. 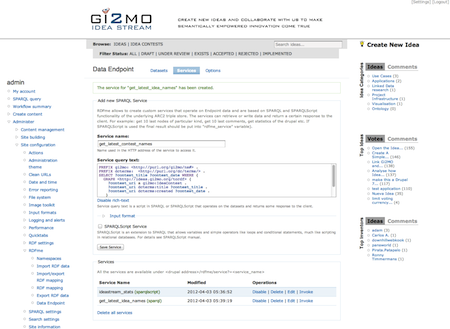 RDFme module for IdeaStream: allows to construct Web Services based on SPARQL queries for ideas stored in the backend triple store. All of those research and development experiences are going to be discussed during the talk. The conference is going to take place in December 10-12, 2012 in London, UK. The presentation slides and research paper will be uploaded to Gi2MO Docs afterwards so keep an eye out for updates! Update: Conference final programme is out. Gi2MO will be presented during Internet Application and Technology session at 14:45, Monday, December 10th. Talk will be given by Geovanny Poveda.